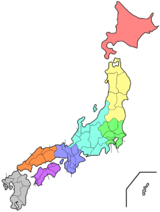 Fukui Prefecture (福井県, Fukui-ken) is a prefecture in the Chūbu region of Japan on the island of Honshū. The capital is the city of Fukui. In the early Meiji period, Fukui was created by the merger of Wakasa Province and Echizen Province. The prefecture faces the Sea of Japan. It shares a northern border with Ishikawa Prefecture. East of Fukui are Gifu Prefecture and Shiga Prefecture. Kifu's southern border meets Kyoto Prefecture. National Parks are established in about 15% of the total land area of the prefecture. Wakashiko jinja and Kehi jinja are the chief Shinto shrines (ichinomiya) in the prefecture. ↑ Nussbaum, Louis-Frédéric. (2005). "Fukui-ken" in Japan Encyclopedia, p. 217; "Chūbu" at p. 126. ↑ Nussbaum, "Fukui" at p. 217.